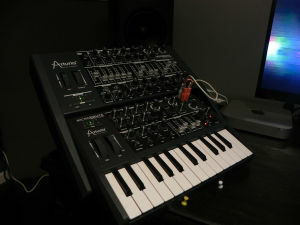 1 you can modify the Minibrute to get a Sequencer instead of an Arpeggiator like the Minibrute SE <– click this for more / it’s silver but same specs as the normal MB. 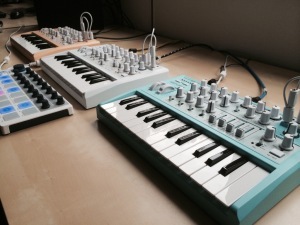 –> Arturia Minibrute Sysex um ARP zu Sequencer zu machen. the Forum • Arturia Microbrute. shows some radical mod – the keys removed on the Minibrute and the Microbrute added as a „controller“ for them all..
and: there will be a Microbrute SE in Grenoble – but some things seem to be wrong or messed up, so.. something is coming, check the news soon: recoloured: white, yellow’ish, or turquise – like the SH101 but more.. „öko“ as we say over here. Zurück Videocast Musotalk: Propellerhead Reason 8 , System 1 / SH2 Plugin/out, Zaquencer, AboModell für Software (DAWs)? MIDI 2.0 – !! Jetzt! !